Q: We initially thought it would be as easy as pulling in an RSS feed from somewhere, but places like Yahoo or Google don’t offer RSS feeds for their showtimes. Doing a little research brought up large firms that provide news and data feeds and that serve up showtimes, but that seems like something that’s designed for high-level sites with national audiences. So, is there any solution for someone who is just trying to display local showtimes? A: This is more complicated than you might think. Some theatres maintain that their showtimes are copyrighted, and (try to) control the publication of them. Others have proprietary agreements with favored providers and don’t publish their showtimes elsewhere, to give their media partners a content edge. What applies to RSS feeds applies to calendar feeds as well. It would be nice to have your local showtimes as an overlay on your personal calendar. But since most theaters don’t make the data openly available, you can’t. 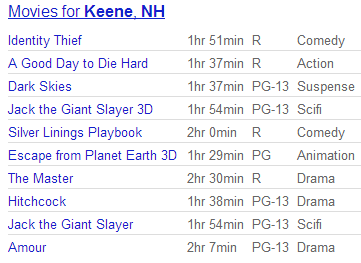 These are listings from the Putnam Theater at Keene State College. They syndicate to the Elm City hub for the Monadnock region of New Hampshire by way of the college calendar which recently, thanks to Ben Caulfield, added support for standard iCalendar feeds. They appear in the film category of that hub. And in fact they’re all that can appear there. If you’re an indie theater and would like your listings to be able to flow directly to personal calendars, and indirectly through hubs to community portals, check out how the Putman, BAM/PFA, and the Bloor Cinema are doing it. Author Jon UdellPosted on 4 Mar 2013 Categories .